The Liberal government is spending $86 million to boost efforts to block smuggled guns at the border and try to stop the scourge of gun violence in the United States from creeping into Canada. The Liberal government is spending $86 million to boost efforts to block smuggled guns at the border and stop the scourge of gun violence in the United States from creeping into Canada. Public Safety Minister Ralph Goodale and Bill Blair, the minister of border security and organized crime reduction, announced Thursday that $51.5 million will be spent over five years for the Canada Border Services Agency to build an all-weather detector dog training facility, deploy more sniffer dog teams and expand X-ray technology at postal centres and air cargo facilities. More training on detecting concealed items in vehicles entering Canada is also planned. Another $34.5 million will go to the RCMP to enhance investigations, training, inspections, technology and intelligence. The money comes from a $327 million pot to tackle gangs and gun violence announced last year. Of that sum, $200 million will go to provinces and territories to address regional needs. Blair said that because gangs have different origins across the country and operate in both rural and urban areas, it's critical to give the provinces money to address specific needs. "Blanket solutions and a one-size-fits-all approach (do) not work," he said. Thursday's announcement comes as the U.S. reels from another mass shooting incident, this time at a Southern California bar. Thirteen people died in the gun attack in Thousand Oaks, California Wednesday night. Blair said Canada has a "fundamentally different" culture and approach to firearms, but Canadians are increasingly worried about the spike in domestic incidents. "What we are seeing is an increase in gun violence across our country, a greater influence, and Canadians ... have told us they're very concerned about the level of gun violence taking part in their communities," he said. Blair said border officials saw 467 seizures of firearms last year, a 19 per cent increase over the previous year. The rate of gang-related homicides spiked in 2016, and violent firearm offences also increased for the third year in a row in 2017. 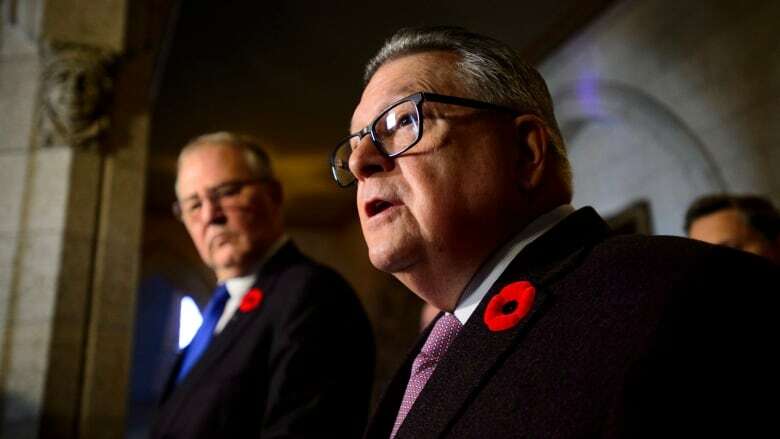 Goodale said the Liberal approach to gang and gun violence includes addressing root causes by investing in housing, job creation and post-secondary education, and by building cohesion in communities. "It really is important to get past the rhetoric and the inciteful language and really focus on the practicalities of how you change things," he said. Blair is carrying out a public consultation on gun control, which could lead to a ban on handguns. That process is expected to be complete by the end of the year, he said. Conservative Leader Andrew Scheer held an event in Brampton, Ont. today to outline how his party would deal "swiftly and firmly" with gangs to get the "violent thugs" off the streets. "People are feeling less safe in their communities and they're losing faith that their government is willing to address it," he said. End automatic bail eligibility for repeat gang offenders. Enshrine a list of gangs in the Criminal Code so prosecutors don't have to prove their criminal nature in court. Introduce tough mandatory minimum sentences for gang leaders. Bring in new criminal offences for ordering someone to commit a violent offence on behalf of a gang. Revoke parole for those who affiliate with gang members.